Ruskin’s Swartwout Series Dampers and Louvers are designed for use in corrosive environments such as wastewater treatment, pulp and paper mills and air pollution control systems. Swartwout Damper Line consists of Models 912, 914, 1104, 1108, 1108AF, 426, 426AF and 851FG. Model 1108AF damper features pultruded airfoil blade design and maximum pressure rating of 28 in. w.g. Swartwout Louvers are available in AFG40 and SFG40 models and are suitable for intake and exhaust applications. Grandview, MO – (April 12, 2018) – Ruskin® recently added the Swartwout Series industrial fiberglass damper and louver lines to its product offering. Constructed of premium vinyl ester resins, these products are ideal for installation in corrosive environments, including wastewater treatment, micro-electronics fabrication, pulp and paper mills, air pollution control systems and corrosion-resistant air exhaust and collection systems. Models 912 and 914 round isolation/control dampers that feature an AMCA leakage Class 1A rating, maximum system pressure ratings of 10” and 30” w.g., respectively, and sizes ranging from 4-to 72-inch diameter. Models 1104 and 1108 multi-blade control dampers with a pultruded V-groove blade design and maximum system pressure of 20” w.g. Model 1108AF multi-blade control damper with a pultruded airfoil blade design, maximum system pressure rating of 28” w.g. and 316SS linkage and hardware. Model 426 multi-blade backdraft damper with a pultruded V-groove blade design, a maximum system pressure rating of 10” w.g. and maximum single-section size of 48”w x 72”h. Model 426AF multi-blade backdraft damper with a pultruded airfoil blade design, a maximum system pressure rating of 16” w.g. and 316SS linkage and hardware. Model 851FG fiberglass inlet vane damper for pre-spinning the airflow to match the rotation of the fan wheel, thereby allowing for optimal performance. Suitable for system pressures up to 10” w.g. and velocities of 6000 fpm. The Swartwout Series fiberglass louver line includes the AFG40 Fiber-Aire adjustable fiberglass louver and the AMCA-certified model SFG40 stationary fiberglass louver. 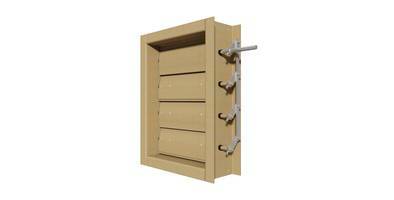 Both louvers feature flame-retardant vinyl ester-based materials of construction and PVC-coated bird screen. They are ideal for intake and exhaust applications; providing strength and durability suited for corrosive environments. To learn more about the Ruskin Swartwout Series fiberglass dampers and louvers, visit www.ruskin.com/category/1000~fiberglass-dampers and www.ruskin.com/category/1004~fiberglass-louvers. For more information about Ruskin, visit www.ruskin.com.